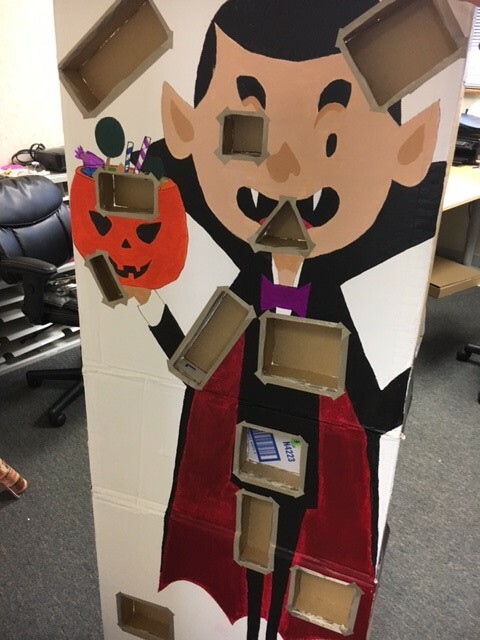 Imagine!’s own Brodie Schultz, who works for our CORE/Labor Source (CLS) department, has built a life-sized Halloween-themed “Operation” game (pictured above). Brodie constructed this game with the help of a tool we’ve discussed in the past: Makey-Makey, along with SoundPlant. Obviously the game is cool, but it goes beyond that. A life-sized game such as this makes it accessible for people who may lack fine motor skills or who use wheelchairs (which can make accessing the traditional sized game boards difficult). The game was a huge hit at last week’s CLS Halloween party. In the video below, Brodie’s supervisor Tim West-Heiss demonstrates the game.